Graveyard Fields — a rather ominously named high valley in the Great Balsam Mountains — is rife with beauty. Fear not on a trip to this outdoor wonderland, the only things that will be buried are your cares and worries! The trails can be combined for a great 3.2 mile loop. Over time, leading up to present day, Graveyard Fields has slowly recovered from its smoldering past to become a high altitude valley teeming with plant life. Today, visitors to Graveyard Fields will enjoy a mixture of Rhododendrons, Mountain Laurels, Blackberry and Blueberry bushes, high country grasses and bouquets of wildflowers. Although the Fields have begun a long healing process their integrity is challenged annually by Graveyard Fields resounding popularity and all the inherent issues related to overuse by the outdoor community. 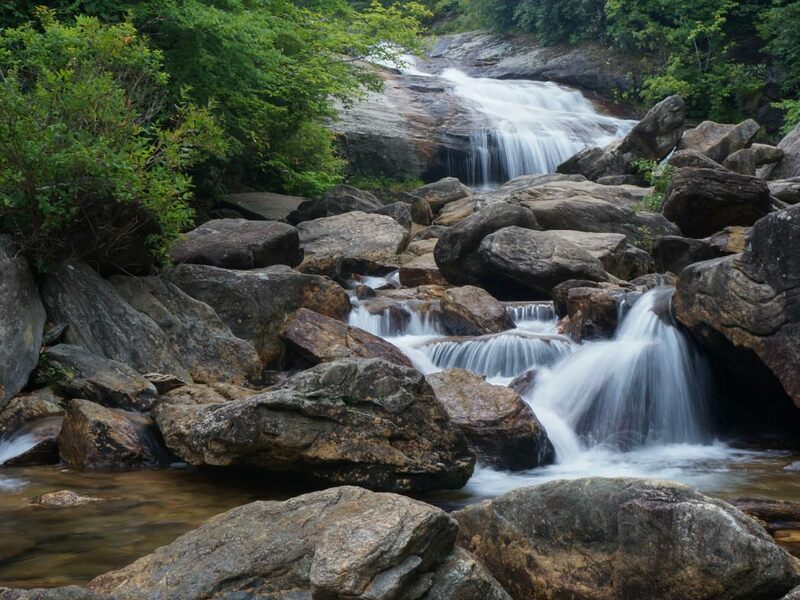 Visitors to Graveyard Fields can enjoy its splendors by way of a newly renovated trail system which includes elevated boardwalks, an intricately integrated bridge across Yellowstone Prong, and an expertly constructed waterfall overlook at Second Falls. 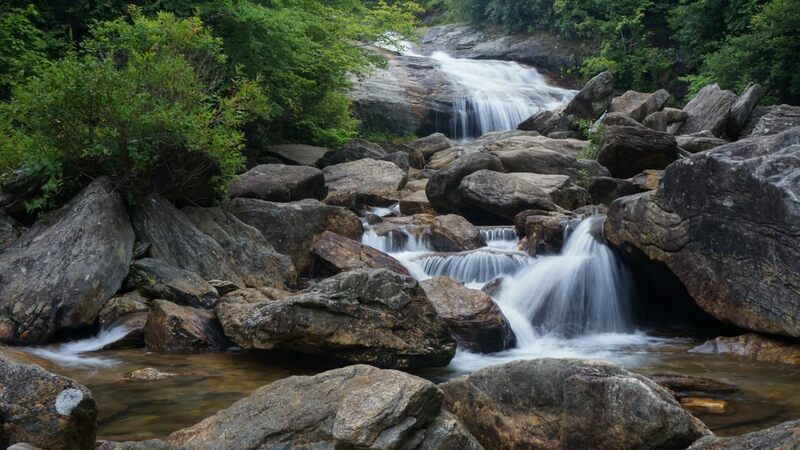 Trails within Graveyard Fields can be combined to form a 3.2 mile loop which meanders through the relatively flat valley and includes views of Upper Falls and Second Falls. A detailed tail map sign stands at the parking lot, take a picture to reference later and begin your travels in either direction. Traveling the loop in a counterclockwise direction gives explorers an immediate reward, just .3 miles in, where a wooden staircase leads to the plunge pool below Second Falls. After returning to the start of the staircase the trail continues to wind through the high valley which is enclosed by the towering massif of Black Balsam Knob. As you work your way up the valley, beside a calm section of Yellowstone Prong, you will come to a signed trail leading to Upper Falls. Take this trail for a better chance of seclusion and a glimpse of Upper Falls. Parking for Graveyard Fields can be found at mile 418.8 on the Blue Ridge Parkway. A recently constructed solar powered restroom facility sits in the parking lot which has 40 spots. If the parking lot is full venture to nearest overlook and make the trek back to Graveyard Fields. Fair warning, parking in the grass on the side of the road will likely earn you a citation on busy days! Camping is allowed in several established sites within Graveyard Fields and dogs are welcomed, but must be kept on a leash at all times.